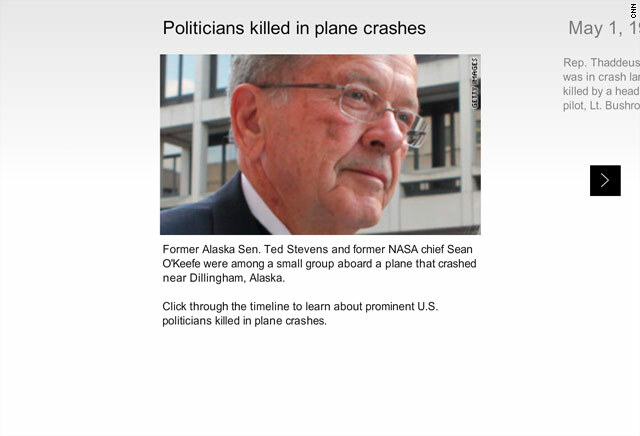 Anchorage, Alaska (CNN) -- It's too early to say whether former Sen. Ted Stevens and the four others who died in an Alaskan plane crash initially survived but eventually succumbed while waiting to be rescued, the chairwoman of the National Transportation Safety Board told CNN Wednesday. "We don't know that information at this point," Deborah Hersman told CNN's "American Morning." "It's going to be up to the medical examiner to determine the cause of death." The plane flew into the side of a mountain in remote southern Alaska Monday night, authorities said. Brutal terrain and bad weather kept survivors waiting 12 hours for rescue after the crash, officials and witnesses said. The accident left five people dead and four others injured. Autopsies on the victims were expected to be completed by the end of the day Wednesday, but Hersman said the NTSB would not release those results. The investigation into the cause of the crash is still in preliminary stages, with teams interviewing first responders, personnel from the flight service center that was in contact with the plane, staff at the lodge from which the plane departed and others, Hersman said at a Wednesday evening news conference in Anchorage. "There's a lot of work we need to do and additional interviews we need to conduct to really establish a firm timeline and we're working to do that," she said. On Wednesday afternoon, NTSB investigators, other federal and state officials, and representatives from the manufacturers of the downed airplane and its engine arrived at the crash site, Hersman said. "We're really putting a lot of the factual information together right now," she told CNN. "We're certainly looking at weather but everything is on the table right now and we haven't ruled anything out." The NTSB was hoping to interview the four crash survivors on Wednesday, "but due to their medical conditions, we were unable to conduct those interviews today," Hersman said Wednesday evening. "Our first priorty is their health and our thoughts and prayers continue to be with them in their recovery." She said the survivors may owe their lives to the fact that "there was no post-crash fire." She said investigators talked to a physician who spent the night on the hillside with survivors and also spoke to emergency responders as they try to determine what happened leading up to the accident. "Right now our first priority is to make sure that they get the medical attention that they need and certainly we'd like to talk to them," Hersman said. "They'll be able to give us a good picture." The Alaska Department of Public Safety identified the dead as Stevens of Anchorage, Alaska; pilot Theron "Terry" Smith, 62, of Eagle River, Alaska; lobbyist William "Bill" Phillips Sr., of the Washington, D.C., area; GCI executive Dana Tindall, 48, of Anchorage, Alaska; and her daughter Corey Tindall, 16, of Anchorage, Alaska. The bodies have been recovered and sent to Anchorage. Injured were William "Willy" Phillips Jr., 13, the son of Bill Phillips Sr.; Sean O'Keefe, 54; his son, Kevin O'Keefe; and lobbyist Jim Morhard of Alexandria, Virginia. Sean O'Keefe is the former head of NASA. Sean O'Keefe is in critical condition, while his son is in stable condition, according to the Providence Alaska Medical Center. Neither appear to have life-threatening injuries, according to a statement from an O'Keefe family spokesperson Wednesday. Morhard is in serious condition and William Phillips is in good condition, the Providence Alaska Medical Center said Wednesday. 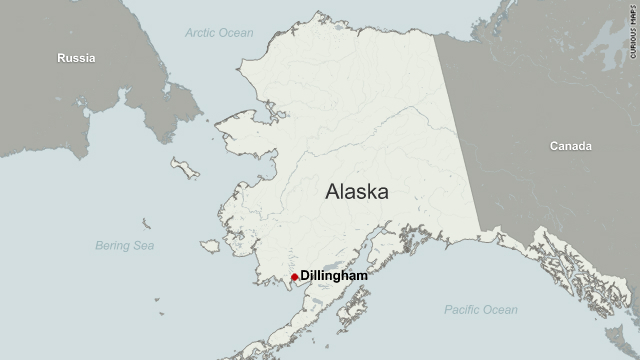 The aircraft, which was taking the group on a fishing trip, crashed around 7 p.m. Monday about 17 miles north of Dillingham in the southwestern area of the state, authorities said. The region, near the Bering Sea southwest of Anchorage, is rugged terrain surrounded by mountains. When the nine people on board had not arrived at a camp on time, the search began. The pilot was not required to file a flight plan, authorities said. The NTSB has found no evidence of distress calls, Hersman said Wednesday night. Pilots flying over the crash site said the amphibious DeHavilland DHC-Z3T Otter flew into the side of the mountain, which has a 40-degree slope. The pilots didn't think anyone on board could have survived such an accident. The area was so rough and rocky that rescuers airlifted in a physician with a satellite phone, and the doctor had to hike 1,000 feet to reach the site, Hersman said Tuesday. Five volunteers, including some with medical training, assisted and stabilized the survivors overnight, officials said. One of the survivors was outside the fuselage when the doctor arrived. Eric Shade, one of the pilots who found the wreckage, said the plane appeared to have traveled at least 100 feet from the point of impact. "It was pretty smashed," Shade said. "The wings were laying behind the fuselage on each side. I couldn't see the floats; the floats were underneath it. I couldn't see anything in the front of the airplane. From the window forward ... everything was gone." Shade said the doomed pilot's path didn't appear to make sense, given the location. "When you're flying down low, into stuff like this, you're flying in the hills -- in between the hills. You have to know where they're at," Shade said. "He flew into the side of the mountain. I have no idea how he got there." Kristopher Abel, an Alaska Air National Guard senior airman who arrived over the crash site by helicopter to aid in the rescue effort, described the scene as a "jumbled mess." "The volunteers who'd gotten there, spent the night there, were frazzled. They were dirty and wet and tired themselves. They had been treating these guys overnight." Abel told CNN the fuselage of the plane was "surprisingly intact." It was where "all but one of the survivors and everybody else were located," he added. Jonathan Davis, another senior airman with the Alaska Air National Guard, said one of the younger survivors was able to leave the plane and "spent the night under the wing" in what he described as a stark crash scene. "There was a scar on the hillside where it (the plane) impacted and skidded up the hill. That was probably about 75 yards long. As we approached the aircraft, you could smell the fuel. The wings were swept back. The engine compartment of the plane had broken off or buried itself into the ground." Because of Alaska's vast size, air travel is common, often through perilous weather. "Planes have crashed up here since people started flying up here. People are going to continue to fly. The weather's going to continue to be difficult," Davis said. Ted Stevens expressed his own fears about Alaskan air travel after a 1978 crash that killed his first wife and four others. In 1972, House Majority Leader Hale Boggs and U.S. Rep. Nick Begich were traveling in a plane that is thought to have crashed in Alaska. It was never found. Nick Begich was the father of one of Alaska's current U.S. senators, Mark Begich. Stevens, 86, was remembered Tuesday as a "lion who retreated before nothing" and for being a guiding light in the formation of the country's 49th state. He was the longest-serving Republican in the U.S. Senate's history and a champion for Alaska. A memorial Mass for Stevens will be celebrated Monday at the Holy Family Cathedral in Anchorage, led by Anchorage Archbishop Roger Schwietz and former archbishop Francis Hurley, who knew Stevens well. One longtime Stevens friend, Russ Withers, said he'd been invited on the former senator's fishing trip but that he couldn't make it because of an obligation in Florida. On Friday, he and Stevens tentatively scheduled another trip for September. Withers said it took several hours after hearing about Steven' death to realize that he could have been on the same plane. "I had one of those 'Oh my God' moments, and my first duty was to get in touch with my daughter and tell that I didn't make the trip, that I was fine," Withers told CNN Wednesday. "It is is something that I am sure some day will hit me a lot harder than it has right now," he said. His footprint can be seen all over Alaska. In Anchorage, where most people fly into the state, a large sign proclaims "Ted Stevens Anchorage International Airport." Gast, Paul Vercammen and Melanie Whitley contributed to this report.